The American Lung Association is using our tax money for partisan politics. 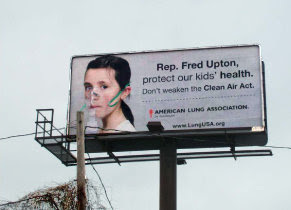 The EPA is funding the Am Lung Association and the Lung Association is running attack billboards against Rep. Upton in his district in Michigan. Don't weaken the Clean Air Act"